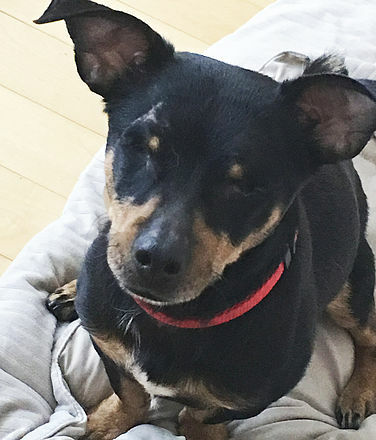 The first thing potential adopters saw when they met Gabriella was a lively MinPin mix eager to dive into her squeaky toy and then dive into a lap for some affection. This joyful girl loved to strut her stuff by tossing her toys into the air and catching them, so there were plenty of double takes when we informed people Gabriella is completely blind. Gabriella was found tied next to an abandoned building on Halloween night. A neighbor heard her cries and called emergency services. 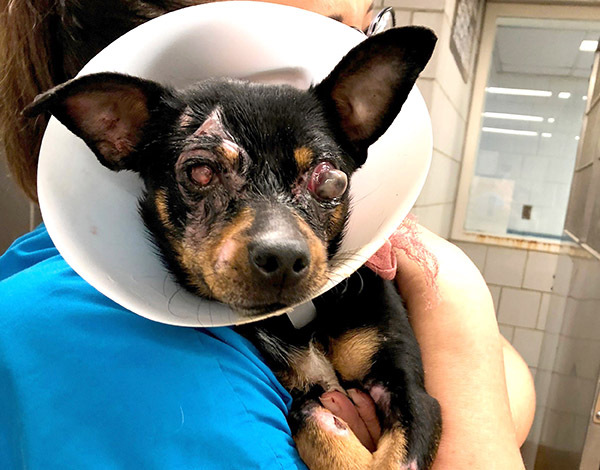 Chicago Animal Care & Control picked up the severely injured dog and contacted PAWS Chicago about Gabriella’s desperate situation. We immediately went to their facility and took her into our guardianship. 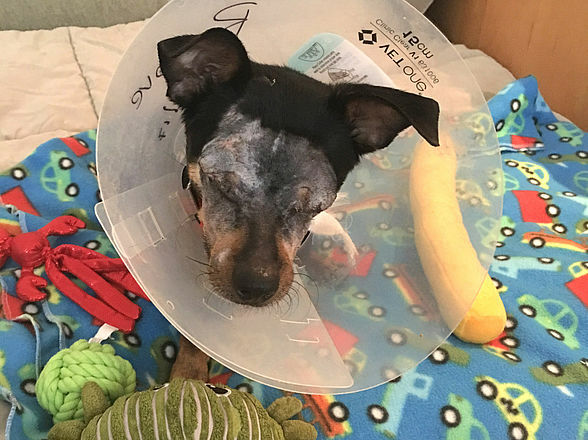 When Gabriella came to PAWS her face was so badly burned from bleach that she had to be immediately sedated due to the unimaginable pain. 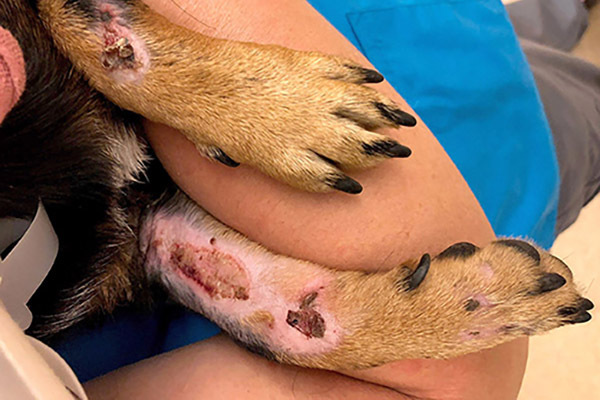 Her wounds suggested the abuse occurred several days prior, so she might have been suffering for days untreated. 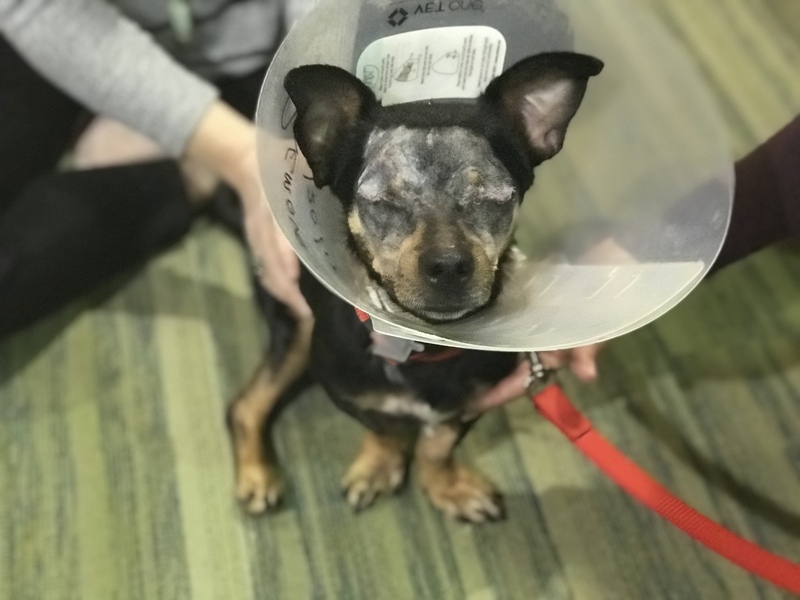 We hoped to be able to save one of her eyes and took her to one of Chicago’s top veterinary ophthalmologist, Eye Care for Animals, but too much damage had been done – both of her eyes had to be removed. The impulse in cases like Gabriella is to be angry for what was done and to despair for what was lost. But Gabriella was the better angel of our nature, encouraging us to embrace the opportunity to heal and thrive. Her resiliency and relentless joie de vivre were an inspiration to us all. So we were not surprised when our petite pup with a giant personality finally found the perfect home. One where she does not need her sight to know she will always be safe and loved. Gabriella is one of thousands of pets that spend time at PAWS Chicago every year. 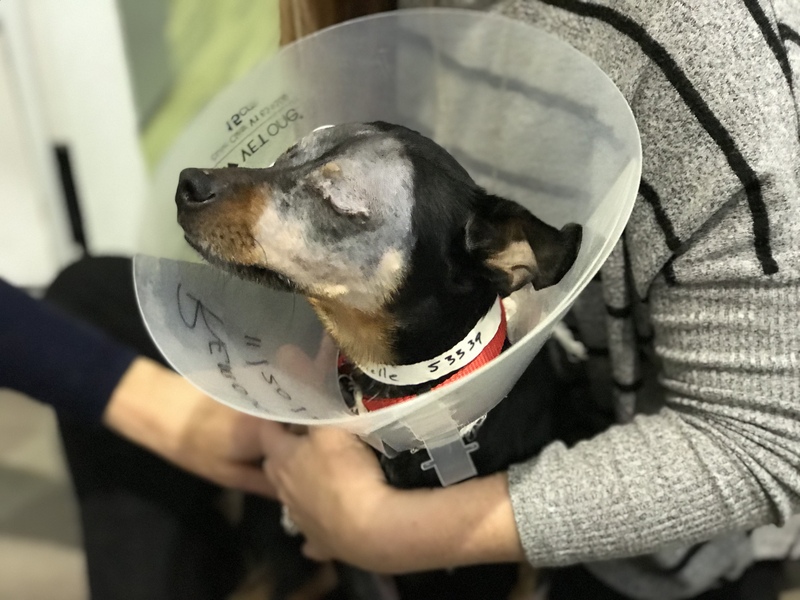 Your support enables PAWS Chicago to save lives and treat emergency rescue cases, like Gabriella, at our robust Medical Center. Please consider contributing to help PAWS Chicago save the next sick or injured pet in need. Below are graphic images taken of Gabriella when she came to PAWS Chicago.